We often hear about how the massive volumes of data the US government collects hold a treasure trove of answers to our most challenging questions – be it on population health, national security, education or how to recoup losses from tax fraud. If only the government could figure out how to make use of all that information. 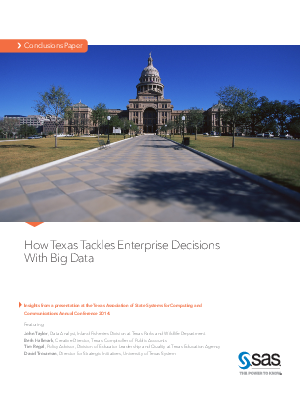 Texas is one example of a government that is using analytics to solve complex problems. As the case studies here demonstrate, agencies and academia in the Lone Star State are putting big data and analytics to work to eliminate waste, improve productivity and, in some cases, even enhance transparency.